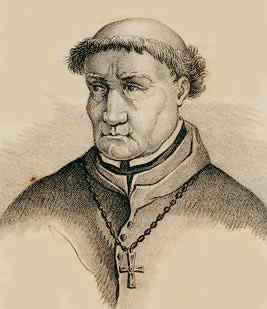 Tomas De Torquemada was known for his cruelty while serving as Inquisitor General of Spain during the Spanish movement to restore Christianity from 1483 to 1498. It is said that he murdered, tortured and drove both Muslims and Jews out of Spain because they refused to accept Catholicism. Some scholars believe Torquemada was responsible for the deaths of up to 2,000 people. Historians say the real number of people put to death in Spain during those years may have only been about 500. What is known is that this priest helped create an internal climate of fear that lead to innocent people being tortured and burned alive. Torquemada met Princess Isabella at about the time he was promoted to the position of prior of the monastery of Santa Cruz at Segovia. For several years he served as Isabella’s confessor and personal advisor, was present at her coronation in 1474, and advised her to marry King Ferdinand of Aragon in 1469. This formed a consolidation of kingdoms and helped Torquemada gain even more political and religious influence. After Spanish forces raided and destroyed the Muslim state of Cordoba in 1492, Spain demanded that all Muslims and Jews leave the kingdoms of both Aragon and Spain. Rather than leave, many Muslims and Jews converted to Catholicism but secretly continued to practice their old faith. This stirred the decision by the crown and the Pope to launch inquisitions not only in Spain but in many other countries throughout Europe. In some areas they also went after Protestants. The religious house-cleaning began in Spain much earlier. King Ferdinand and Queen Isabella petitioned Pope Sixtus IV for an inquisition there in 1478. The Pope not only granted the request but appointed a number of priests to serve as inquisitors throughout Spain in 1482. Torquemada was among them. A year after this, Torquemada was named Grand Inquisitor of Spain. He held this office until his death in 1498. He reorganized the Spanish Inquisition, establishing tribunals in Castile, Sevilla, Jaen, Cordoba, Ciudad Real and Saragossa. He set out on a quest to rid Spain of all heresy. Torquemada was very good at his job. Under the edict of 1492, an estimated 200,000 Jews left Spain. Another 50,000 took baptism, declaring themselves Christian so they could stay in Spain. Many of these became known as Marranos who secretly kept their Jewish traditions. During the worst part of the Spanish Inquisition, from 1478 to 1530, historians believe from 1,500 to 2,000 people were found guilty of heresy. The standard practice of the church was to turn these people over to the crown for punishment. Some were burned or beheaded. Others were sentenced to public ridicule. Not all were killed. Once the Inquisition had its start it seemed difficult for the church to put on the brakes. The Catholic Church conducted inquisitions throughout the Western World and even in North America from the Middle Ages on until sometime in the Seventh Century. Over the course of 500 years, an estimated 6,000 people were put to death for pretending to be loyal to the Catholic faith but secretly practicing their old faith. Trials of people for “unorthodox religious views” were common throughout Europe until the Nineteenth Century. This was one of the driving forces behind the European movement to settle in the North American colonies. Torquemada’s role as Grand Inquisitor of Spain forever established him as a leader in this ugly period. It was said that condemned prisoners were forced to wear a special penitential garment that established their guilt. Those sentenced to death wore garments showing designs of hell’s flames or sometimes demons, dragons or snakes engraved on it. While highly acclaimed by the Pope and the cardinals in the Vatican, Torquemada was not as well liked in his own community. After his death in 1498, he was interred in the monastery of St. Thomas Aquinas in Avila. But the tomb was ransacked in 1832, two years before the Inquisition was disbanded. His bones were stolen and ritually incinerated.